“The audience is not going to be prepared for what we have in store for them,” said junior Chris Catania at the last rehearsal before Broadway Night, Thursday, March 14th. 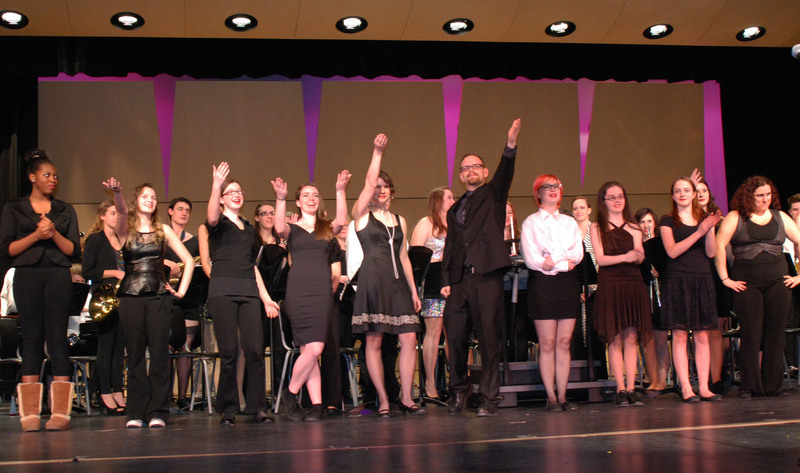 While the selections chosen may have been surprising the students’ musical talent was excellent as expected as the RHS band and chorus performed songs from the musicals Jekyll & Hyde and Chicago in this year’s annual show. Selections from Jekyll & Hyde with senior Christian Malo in the leading role provided the audience with an eerie vibe not traditionally presented at Broadway Night. The RHS band opened the night with “Jekyll & Hyde,” the namesake of their first round of selections. Junior up-and-comer Olivia Olsen surprised her classmates with a lovely rendition of “Someone Like You.” This was Olivia’s first solo on the RHS stage and hopefully not her last. Freshmen friends, Ella Engle and Leah DeCecco sang “In His Eyes,” a number they had diligently practiced even in their down time at swim meets this winter. Chicago, a musical set in the jazz era of the 1920s, may be one of the most risque selections ever represented on the RHS stage. Senior Sonya May performed “Funny Honey” fol lowed by her fellow senior Molly McLellan’s performance of “When You’re Good To Mama,” in which she actually ventured into the audience and flirted with her watchers — just as performers of the 1920s would. The performers from Chicago were convincingly dressed to accentuate the promiscuity of the twenties. Female performers wore sequins, feather boas, and fishnets representing the provocative “flapper” fashion of the era. “We just kind of went for it,” said senior Charis Nelson, when asked if the selections from Chicago had any censorship. The musical number, traditionally performed by women, was tackled by six brave male students — junior Ian Haas and seniors Mike McCauley, Kevin Strobel, Dan Phipps, Christian Malo, and Chris Carchedi. The boys danced on chairs and dressed in drag in one of the most risque numbers of the night. They wore makeup, short dresses and skirts, sequins, and heels. Chris Carchedi even stuffed his shirt to appear more feminine. The performers clearly enjoyed themselves and played their parts to the max. Sophomores Nicole Cook and Alyssa Collins sang their first duet beautifully and then the RHS ended the evening with Selections from Chicago. Although this year’s choices of musicals were risky, the performances were as professional as in any other musicals in recent memory on the RHS stage. The audience experienced a range of emotions from pleasantly surprised to moved and even had a few moments of overwhelming humor by the end of the night, making this year’s Broadway Night one to remember. Follow this link to view our photo gallery of Broadway Night.